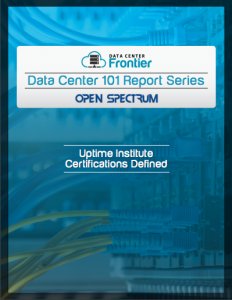 The Data Center 101: Uptime Institute Certifications Defined report, brought to you in partnership with Open Spectrum, is part of the Data Center Frontier Data Center 101 Special Report series. At some point while working in or around the data center industry, there will be mention of what “Tier” a specific facility is — or is not. Data Center 101: Uptime Institute Certifications Defined is part of a group of 14 reports that cover the ins and outs of the data center industry, serves as a very brief overview of what this “Tiered” classification system amounts to. This section also serves to define the different certifications outlined by The Uptime Institute.